In a heavy skillet over high heat, pour in a small amount of oil. When it’s hot, add the chicken pieces in a single layer. Let it sit on one side, undisturbed, for about a minute, then stir the chicken around and cook it until it’s totally done, about 3 to 4 minutes. Peanut Sauce: To make the peanut sauce, combine all the peanut sauce ingredients, adding water until it gets to a nice drizzle-able consistency. Taste and add more of what it needs: spice, sweetness, etc. Set aside. 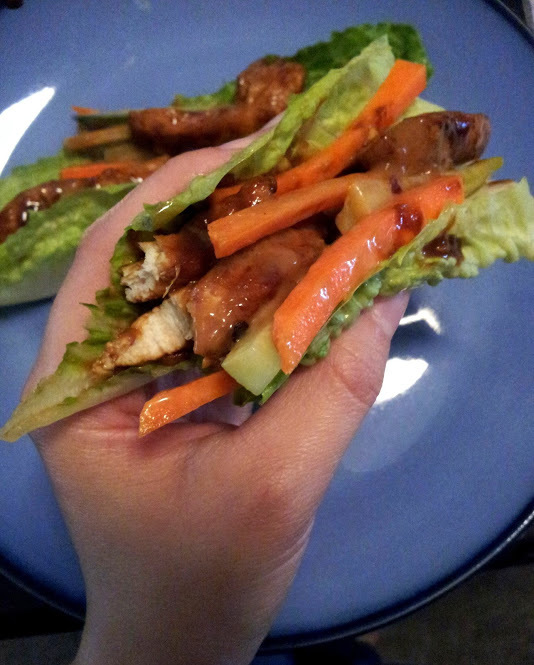 Lay our lettuce leaves, add chicken, carrots and cucumber then top with peanut sauce.